design that results in a “Work of Art”. complete a chair and take home some bragging rights. 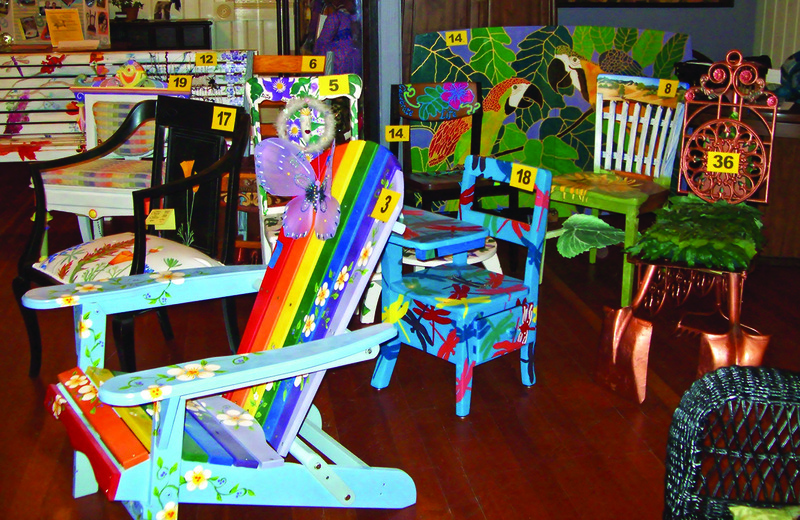 Chairs for Charity returns to the San Andreas Town Hall on Saturday, January 26, 2013.
and chair items in the live and silent auctions. collaborating to bring this fun-filled and must attend event to you. their website www.calaverasarts.org to learn more. Happy holidays! The next meeting of the Mother Lode Ragtime Society will be on January 12, 2013 at the Sutter Creek Ice Cream Emporium. Tom Brier will be on hand to provide lots of toe-tapping music; but all who would like to play are welcome. For those who would like to hear the music AND enjoy a nice meal, Stevens Price will be doing one of his famous dinners. Dinner will be served between 6 pm and 8 pm and will consist of Chicken Cordon Bleu, veggies, garlic mashed potatoes, salad, rolls, and a drink of choice (coffee, tea, etc.--or you may bring your own wine if you like). Cost is $20 per person. Reservations are recommended for parties of 4 or more who would like to sit together. Call the Ice Cream Emporium at (209) 267-0543 for reservations. It's never too early to start thinking about next year's Sutter Creek Ragtime Festival. Dates are August 9 -11, 2013. Watch the website (www.suttercreekragtime.com) for information as it becomes available or call (209) 405-1563 if you have questions. Happy new year; and hope to see you soon! Brubeck Institute Jazz Quintet (BIJQ). unforgettable impression in Calaveras as well. The next Ovations performance is Sunday, January 27 with Joe Craven Trio. San Andreas. Hours are weekdays, 9:00 am to 4:00 pm and Saturdays, 11:00 am to 3:00 pm. AmadorArts and Hanford Street Gallery present an exhibit of affordable art featuring local artists. All pieces for sale $125 and under. Gallery open Thursday- Saturday 10am-5pm & Sunday 11am-430pm. Historic Main St., San Andreas. Still need a special gift? Over 50 artists have a variety of items for sale, including small original paintings, prints, photography, ceramics, jewelry, cards, candles, wearable art, and much more…very unique for your very unique friends. Each purchase supports local artists and the Calaveras County Arts Council. Visit www.calaverasarts.org for all the details. 55:00 P.M. - 9:00 P.M. The Lone Wolf at the Jackson Rancheria Casino. Piano and vocals ranging from Sinatra to Sedaka...The Beatles to Basie. Bring your requests! Great food, great drinks, great service! See the lounge menu, dinner menu and dessert menu at the Jackson Rancheria Casino website. Just scroll down to online reservations and the menus on the dining website. 7:00 p.m. to 10:00 p.m. Open Jam at the Pine Grove Schoolhouse. All ages, no cover, hosted by the Rock and Roll Acoustic Show. All instruments welcomed. The format will be first come, first serve, and one or two people at the most at a time sitting in with the house band. 5:00 P.M. - 9:00 P.M. The Lone Wolf at the Jackson Rancheria Casino. Piano and vocals ranging from Sinatra to Sedaka...The Beatles to Basie. Bring your requests! Great food, great drinks, great service! See the lounge menu, dinner menu and dessert menu at the Jackson Rancheria Casino website. Just scroll down to online reservations and the menus on the dining website. 4pm -6pm. No cover, all ages welcome: LIVE MUSIC... Amazing food... Wonderful Service... Come join in the FUN! Saturday - 6pm-8ish: Old Soles (masha & geff) at the Kirkwood Inn, Hwy 88 opposite Kirkwood Mountain Resort. It'll be a sort of pre-pre-New Year's Eve celebration while everyone can still see straight. And ski straight. Please drive safely. http://www.oldsolesmusic.com no cover, all ages. Old Soles (masha & geff) at the Volcano Union Inn and Pub in Volcano. It's the anniversary of the wedding of Percy and Mary Shelley back in 1816. He wrote "To A Skylark", which begins, "Hail to thee, blithe spirit!" She wrote "Frankenstein". We dedicate this evening to all those couples who seem mismatched, but aren't. http://www.volcanounion.com http://www.oldsolesmusic.com no cover, all ages. LIVE MUSIC... Amazing food... Wonderful Service... Come join in the FUN! The Winemaker is the irreverent Twisted Oak. Come meet Mark, the Winemaker, and enjoy $5 glasses of their Verdelho and their limited production "Sheep Shack Vineyard Tempranillo". Optional specials will include "Braised Lamb Shank" and "Sautéed Halibut topped with Rock Shrimp"
Let’s get this New Year off to a rollicking good start!!! Andis Seeks MusicianAndis Wines is looking for a musician/guitar player/violinist to play light background music for our new tasting room in Sutter Creek. Gigs would most likely be Friday and Saturday evenings for approximately 3-4 hours, possibly more. If interested please contact Jenae at (209) 245-6177, or emailjenae@andiswines.com. Thanks for your support of the Arts in Amador County! Happy Holidays. The band has just released its new 23rd album, “Dark Ocean”. In celebration of the new release the band will be performing many songs from the album live. Dark Ocean is based on songs of pirates & privateers that sailed the oceans off America in the early years. Many of the songs are very rowdy about the hardships faced at sea by sailors and about their short life spent in the taverns on the old coast! Think of this concert as Santa Claus grew a Black Beard! Along with the bands tribute to the pirates of the high seas they will perform many original and traditional holiday favorites. Band member & songwriter Patrick Michael Karnahan will be introducing two original songs on this occasion, Sierra Christmas and The Christmas Train. At the end of the concert the whole audience will be invited to sing along with the songs they know and love. When you take Celtic, Spanish, and Italian Music, and mix it up, you get the true nature of the Black Irish. For twenty-three years this band has created an original sound that no other band has. With over 700 concert performances to date and airplay around the world, the band has kept very busy spreading their brand of progressive folk music to a large audience. Performing both traditional and original music the band is very focused on presenting acoustic music in a very exciting up-beat way that appeals to all ages. The band has written and recorded 96 original songs that appear on many of the bands twenty-three CD recordings. Many of the original works written by the band are based on Celtic history. Sunday, January 27, 2 pm. Chamber music concert presented by the Mother Lode Friends of Music. String quartets by Leclair, Mozart, Frosali, and Shostakovitch, and the Quintet for piano and strings of Dvorak. Corina Stoian and Joseph Gold, violins, Debbie Dare, viola, Alexandru Dumitrache, cello, and Ron Brickman, piano. Free admission. Sutter Creek Church of the Nazarene, 14050 Ridge Road, Sutter Creek. Call 209-293-4227 for more information. Rosebud's Cafe in historic downtown Jackson! Poetry. Stories. Oratory. Music. Dance. Comedy. Bring it! No purchase necessary, though we do serve tasty treats such as locally roasted coffees, local wines & beers, and farm fresh foods. Free wifi! This event sells out very quickly every year, so be sure to get your tickets now! Calaveras Arts Council Announces Ovations 2013 Schedule and PerforminFor over 30 years, Calaveras Arts Council has brought a variety of concerts to the rural residents and guests of the Gold Country. Ovations 2013 Performing Arts Series features five high quality, affordable performances at Dr. Elliott Smart Performing Arts Center located at Bret Harte High School, 323 Highway 49, in Angels Camp. 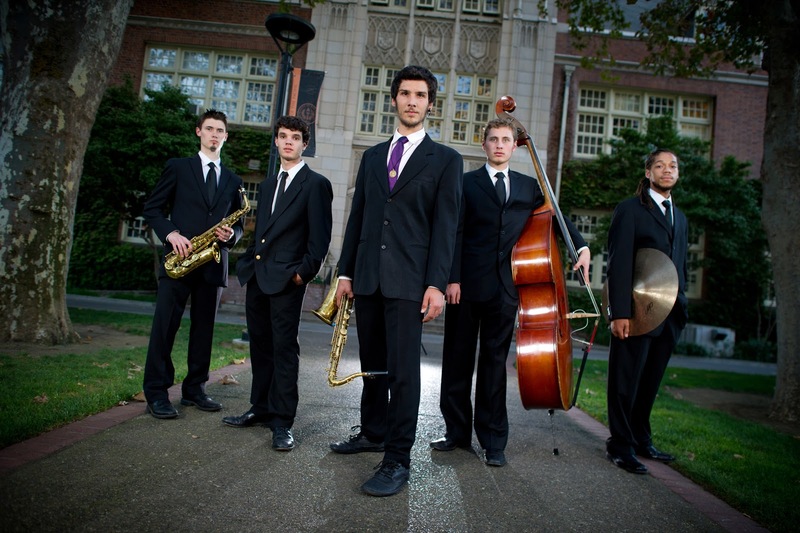 The Brubeck Institute Jazz Quintet represents the next generation of jazz musicians who are pushing the music forward in new directions. Jazz, a true American art form, has evolved from the fusion of African music and European classical music in the late part of the 19th Century. It is unique in its use of complex rhythms and harmony. Also unique to jazz is that it is an improvised art form, no one performance is ever the same. Joe Craven, John R. Burr, and Kendrick Freeman make up this power trio of keyboards, key bass, drums, fiddle, mandolin, found sound and vocals. Joe Craven Trio has a celebrated array of sound paying tribute to Traditional American Folk, Blues, New Orleans, Swing, Funk, as well as the music of Brazil, Haiti, Ireland, Cuba and Puerto Rico. The music is crisp, tight and full of groove. Zimbabwe Dancers Founded in 2000, Tawanda muChinyakare means “we are many, all in the deep tradition of our ancestors, in ChiShona, a native language of Zimbabwe. Chinyakare Ensemble presents authentic Zimbabwean music and dance, and merges powerful traditional art forms with innovative movement and soulful form. The Felici Trio is the musical home of Belgian pianist Steven Vanhauwaert, German violinist Rebecca Hang and American cellist Brain Schuldt. Felici members are prize winners of the Los Angeles Liszt, Yellow Springs, and Osaka music competitions. As individual musicians they are each virtuosic, musical and engaging. As a trio they are dynamite! From intimate to bombastic, their synergy, energy and creativity make this trio compelling and unforgettable. Their adventurous programming is unusual and attractive." Chilean born, Viviana Guzmán, is described by the New York Times as "an imaginative artist," her spirited interpretations bring a new dimension to flute compositions with her sparkling breathings, full joie de vivre, energy and zest. She releases melodic potential in her music, be it in ductile musings or sparkling fountains of tones. Viviana Guzman Group consists of flute, piano, bass and drums. Dynamic. Acoustic. Celtic. With Celtic dancers! Join Molly's Revenge and special guest vocalist Christa Burch with the Rosemary Turco Irish Dancers for an evening of music, song and dance associated with the festive season. 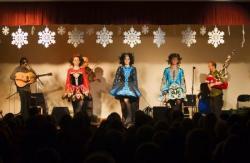 The performance will include Christmas songs both old and new from many lands, all played with a Celtic twist. You'll have an opportunity to join in and sing some of your favorite carols, and our dancing guests will surely set your toes tapping. Molly's Revenge, whose lineup includes bagpipes, fiddle, whistle, guitar, mandola, and bouzouki, have toured extensively in the USA and in Australia, China and Scotland. The band is known for its unique and infectious on-stage enthusiasm. The classic combination of bagpipes, whistle, fiddle, and song, with guitar, bouzouki, and mandola accompaniment, guarantees an enjoyable experience for all fans of Scottish and Irish music. Their arrangements of traditional jigs and reels bring these dance tunes up to date with a driving, hard- edged accent that always leaves audiences shouting for more. Aaron Jones, bouzouki player with Scottish Folk Band of the Year Old Blind Dogs, produced the band's tenth recording, Aged 10 Years, which was released in March 2011. Guest vocalist Christa Burch possesses a singular voice: warm, supple, expressive, intimate, and instantly recognizable. Part of a vibrant new generation of American folk singers, Christa deftly marries intuitive musicianship and storytelling through song. "There is an engaging freshness and yet an impressive maturity in their playing. There is also a lovely balance of repertoire, alternating a familiar with a most arcane selection of tunes and songs." --Mick Moloney, National Heritage Award recipient. "Revered in California as one of its most energetic, exciting and innovative bands, Molly's Revenge has a produced an album that is a total joy." --Shay Black, of the legendary Black family. "They bring to the music a vital and joyous creativity that excites even the hardest of hearts." --John Doyle, founding member of Solas. This was a really great show last year, great variety of Celtic music and traditional Irish dancing, so don't miss it! Calling all artists! Chairs for Charity is back. Now is the time to put your creative thinking caps on and create the most unique chair, stool, bench, or artistic chair-like design that results in a “Work of Art”. This is a chance for local non-profit groups, schools, individuals or organizations to beef up their coffers with just a little creative effort. Professional artists and community groups receive 40% of the auction price your item brings. It is very important to note that 2013’s total entries will be limited to 30. So, time is of the essence. Be the first to complete a chair and take home some bragging rights. Chairs for Charity returns to the San Andreas Town Hall on Saturday, January 26, 2013. The fun starts at 5:00pm and runs to 8:00pm. The Town Hall has plenty of space for guests to sit and enjoy a delicious buffet dinner created by the Pickle Patch, enjoy a beverage from the no-host bar, visit with friends, participate in rounds of Xtreme Musical Chairs, select from the many valuable raffle prizes and, most importantly, bid on chairs and chair items in the live and silent auctions. Two community non-profit groups are, again, joining forces to present Chairs for Charity 2013. Get ready, Amador, to get down….to having a good time. This winter, on Fridays every two weeks AmadorArts will once again be presenting live local music from 6-8 pm. The first of the season will be January 18 in Ione at Castle Oaks Golf Club, and the three subsequent concerts will be at Teresa’s Place in Jackson. The series is being called “Free Fridays + 2.” Get it? No cover; it’s free! The fun starts at 6:00, ending at 8:00 pm. The bar at Caddy’s will be open. Since the restaurant closes earlier in the day, plan on eating either on the way or afterwards. From downtown Ione, go north on Highway 104 (aka Ione-Michigan Bar Rd.) just over a mile. Turn left into Castle Oaks Drive. Go straight to 1000 Castle Oaks Dr.
Get a group of friends together; it’s a great way to kick-off the weekend. The next “First Friday + 2”” will be February 1st at Teresa’s in Jackson featuring world beat music of Cuca Muluca. Save the other dates of Feb. 15 and March 1st. Be sure to visit www.amadorarts.org., which is always updated with the latest info on these concerts and other events. Or, call the office of AmadorArts at 209-267-9038.